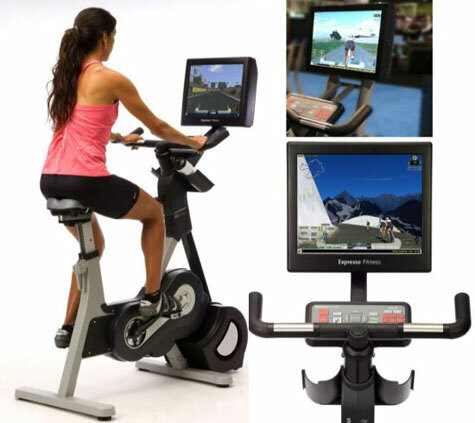 Interesting product from the house is the new Expresso S2u bike, which is an update to S2 Exercise Bike and bike is a Web-enabled ‘exergaming’ fitness bike that simulates riding outdoors by way of a 17-inch LCD screen showing more than 30 virtual courses that vary in difficulty and terrain. With the new ‘Chases’ function, exercisers can follow or race against configurable ‘Pacers,’ and a unique ‘Ghost’ ride function allows them to race against their own best time. The Dutch Bicycle Company has created a Conference Bike, which promises to be the sure-fire ice-breaker in corporate or social environment. 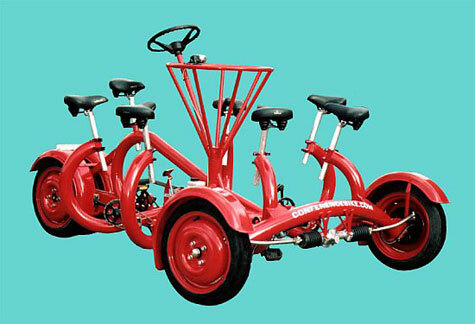 Aptly dubbed CoBi by American artist/inventor Eric Staller, the bike is powered by six peddlers while one steers it around. In case you’re guessing how this bike would be useful in scenarios other than a corporate set up, lemme tell ya the two models of the bike, CoBi-5 and CoBi-7 are already being used to ferry employees on the Amazon.com campus in California, as a tour bike in Berlin, and as a corporate team-building tool in London. 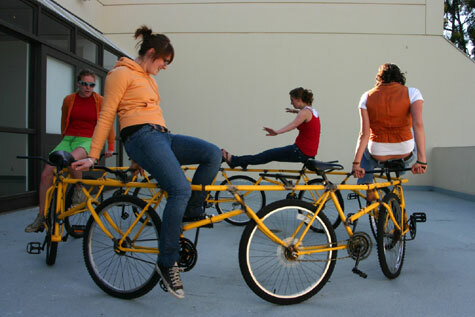 Nine salvaged bikes were reassembled into a carousel formation. The bike is modular and can be dismantled and reassembled. It is normally left in public places where it can attract a variety of riders. The Folding Bike is everything one would expect from Mercedes-Benz – yet remains an acceptable option for navigating any urban environment. 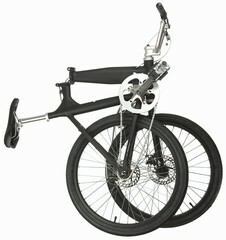 A patented mechanism allows the bike to be folding effortlessly in a two-step process. A quick-release lever near the seat brings the front and rear wheel together, and a second lever above the front wheel allows the handlebars to pivot down. Hokey Spokes are unique bicycle safety lights that allow riders to display computer-generated images and text inside the spoke cages while riding at night. Not only are Hokey Spokes fun and interesting, but they also provide important side visibility, which is mostly unavailable in today’s standard bicycle lights. 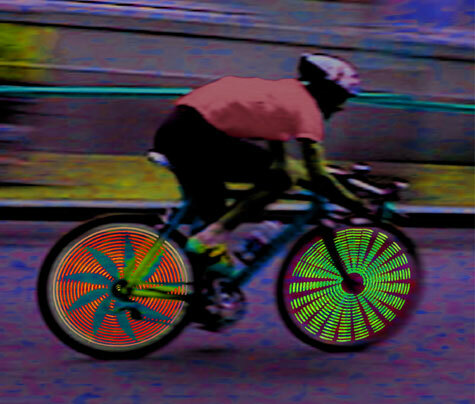 Hokey Spokes consist of transparent “blades” that attach to your bicycle spokes. As these blades spin during riding, a computer inside the blades modulates the internal LED lights so that design images and text appear. 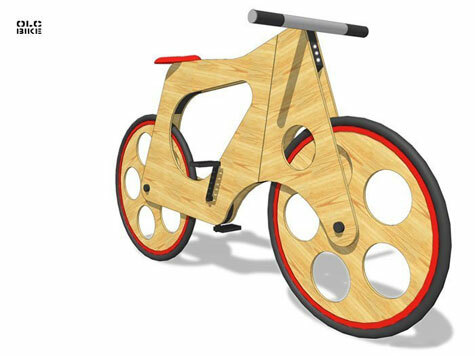 The user can decide how many spokes they want to place on the bicycle wheel. Up to 6 “Blades” can be placed on each wheel. The more blades, the more visibility and persistence of vision at lower speeds. Hokey Spokes are designed so that they fit virtually any mountain or road bike with a wheel diameter of 24″ or greater. Hokey Spokes can be used on front and back wheels at the same time. 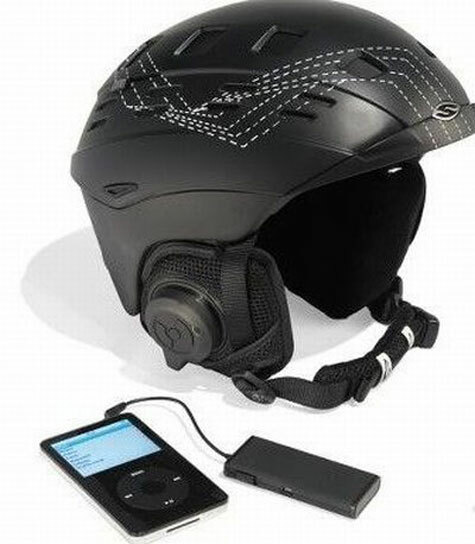 The Bluetooth Sports Helmet which is selling will let you get your groove on while you are carving your way down a mountain, instead of you know, listening for signs of danger. I see a place for this in enabling communications on the slopes, it makes it easier. Andrew Maynard, an Australian Architect, is well known for his stylish, environmentally sustainable designs. 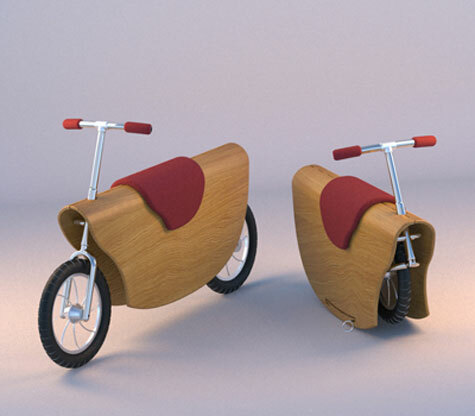 The OLC bike is one of his most remarkable works, all of the building material was low cost since it’s all recycled. Using CNC Technology it can be assembled quickly and easily. Like most athletic gear these days, bike lights are getting lighter, more complex and more expensive. This fall, a few well-padded bikers are lining up to buy the “Betty,” a blindingly bright light that retails for as much as $1,185. The Betty, made by Germany’s Lupine Lighting Systems, generates so much heat that if a rider isn’t moving fast enough to create wind, the light will automatically start dimming itself to prevent the light from overheating. 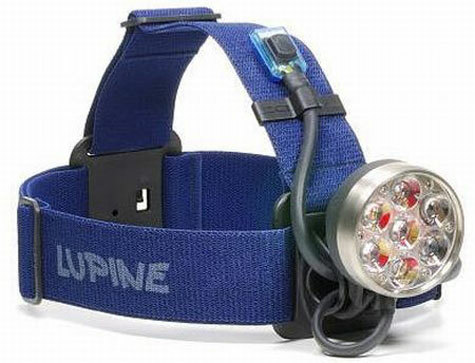 At 1,400 lumens, it’s about as bright as a car’s headlight, the company says. There’s a wait-list of up to two weeks for the light, which is made up of seven LEDs.